Hello sir, I am Sachin. I am from Mumbai. I want you to help me by providing me with the Mortgage NOC form of City and Industrial Development Corporation (CIDCO). Can you help me? lessee for the purpose of Residential/ Commercial/ ------------------------- Use. 2. 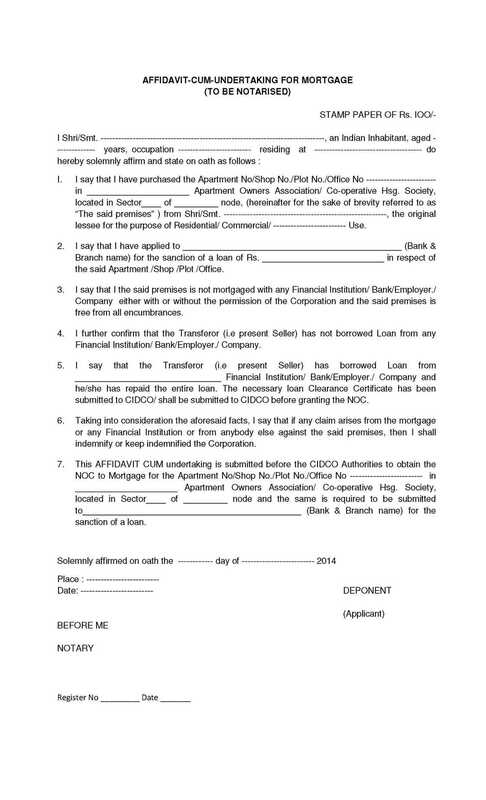 I say that I have applied to _____________________________________________ (Bank & Branch name) for the sanction of a loan of Rs. _________________________ in respect of the said Apartment /Shop /Plot /Office. 3. I say that I the said premises is not mortgaged with any Financial Institution/ Bank/Employer./ Company either with or without the permission of the Corporation and the said premises is free from all encumbrances.